Help Protect the Endangered Rusty Patched Bumble Bee! Wild bees like the rusty patched bumble bee aren’t just beautiful creatures emblematic of summertime meadows; they’re also central to the functioning of natural ecosystems and agricultural production. But sadly, the rusty patched bumble bee has lost almost 90 percent of its range in the past 20 years because of habitat loss, climate change, pesticide use, and other threats. NRDC was instrumental in getting the bumble bee listed as an endangered species in 2017, but now President Trump’s Interior Department refuses to take steps required by law to protect the bee’s fragile grassland habitat. That’s why we’re rushing to court to save the rusty patched bumble bee. And as we fight in court, we need thousands of activists like you from across the country to keep the pressure on the agency. Tell the Interior Department to protect the rusty patched bumble bee and its critical habitat. 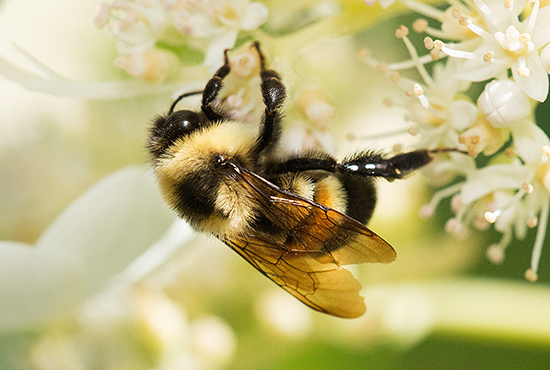 Tell the Interior Department to protect the rusty patched bumble bee and its critical habitat under the Endangered Species Act — as required by law. Protect the endangered rusty patched bumble bee! Dear Acting Secretary Bernhardt: I'm calling on you to take immediate steps to protect the endangered rusty patched bumble bee and its fragile grassland habitat. The plump pollinator is a member of the bumble bee family, which plays a vital role in the production of many crops including blueberries and tomatoes. But sadly, the rusty patched bumble bee has lost almost 90 percent of its range in the past 20 years because of habitat loss, climate change, pesticide use, and other threats. Please take action to save the rusty patched bumble bee from extinction and stop your efforts to gut the critically-important Endangered Species Act. Thank you for your time.